One of the key elements to running any successful association trade show is shipping. That’s why association trade shows need a transportation broker and logistics manager. 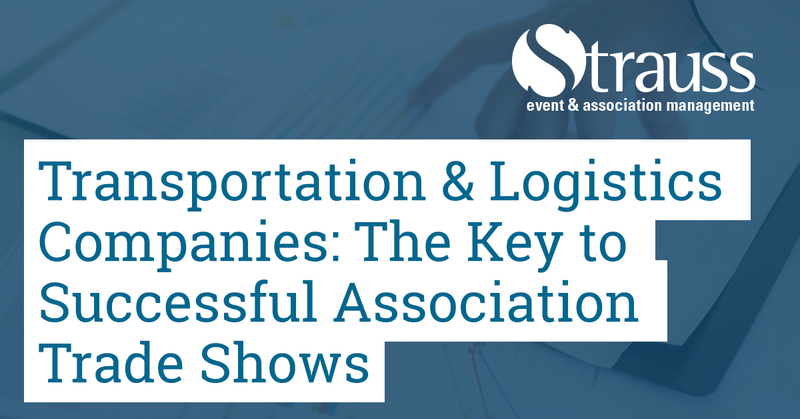 Having now planned a national (or Canada-wide) trade show tour that included exhibitors participating in anywhere from one to four cities on the tour, it became apparent to me that the role of transportation broker and logistics manager is critical to the smooth operation of a multi-destination trade show. And as an event manager, it is my job to ensure that everything runs smoothly! During this multi-city trade show that we planned for one of our association management clients, I communicated regularly with transport broker Rob McCall, owner of Recall Trade Show Logistics. Recall is our client’s longtime transportation broker and on-site floor manager. After the dust had settled from the tour, I sat down with Rob to talk about trade show freight and what it takes to make moving in and out of trade shows seamless. I wanted to be able to share what a transport broker does and what they need from an association to make their job easier. What does a freight manager do? I coordinate the movement of exhibitors’ freight from venue to venue. I coordinate unloading of the trucks at each venue and delivering the freight to the appropriate booth, and I oversee the set-up of the trade show in cooperation with the show services company and the event manager. During set-up and load out my team and I are onsite to assist exhibitors. We provide shipping labels and manifests for each company to fill out and attach to their goods. I also coordinate the loading of the trucks and the show tear down. I book the trucks and drivers for the tour, and I offer storage facilities for our exhibitors to use when there is a break during the tour and it would be cost prohibitive to send their freight home and then back out again. In a nutshell, I provide my clients with worry-free shipping for point A to point B. All the trucks and drivers that I use have been vetted by myself and my company for cleanliness, road worthiness, and safety. What makes a good trade show venue? The best venues have loading docks that can accommodate a 53-foot trailer, with doors at least 103 inches tall. There should also be a forklift available for rental and direct access to the exhibition hall from the loading dock. A venue staff member that is knowledgeable and willing to adapt to new and constantly changing circumstances certainly makes things easier. Examples of well-planned exhibition halls in Canada can be found in Toronto (International Centre), Vancouver (Vancouver Convention Centre) and Calgary (BMO Centre). What makes a venue difficult to work at? If the venue doesn’t have a loading dock it makes unloading freight extremely difficult. Of course, this can be overcome by hiring extra staff to manually move freight into the hall. It will also add time to the unload. Short loading doors can be an issue as well. Many of the larger exhibitors pack their freight in tall cases. It the cases do not fit through the doors they have to be unpacked manually and then moved piece by piece to the exhibition hall. This adds cost and time to the unloading and setup of the show. Sometimes working in a newly opened venue has issues. If the exhibition hall is carpeted, you may not be allowed to drive a forklift on it. Freshly painted venues look great to the delegates and attendees, but can end up costing the show organizers if the walls are scratched or damaged during move-in and move-out. What information do you need from an association’s event manager and the venue prior to move in? I like to know what the physical aspects of the venue are. A detailed floorplan is always necessary for me to plan the load-in. An equipment list from the venue will help me to determine what needs to be rented from an outside supplier. It’s much better to know what’s available before arriving onsite and then having to scramble and improvise. I also need a booth layout. This allows me to deliver the freight to the correct booths. I like to have the show décor company’s contact information as well. Sometimes it is important to connect with their onsite team prior to load in day. Before the exhibitors are allowed in the hall to unpack and set up their exhibits, my team needs at least five hours to unload and distribute the freight. Working with an organized and dependable transportation company makes touring a trade show across Canada much less complicated. This can help anyone who manages association events to know what questions to ask venue representatives and how to run a successful event.